We know your life is busy... Select the dinners you want. Save 10% today on this product. Use coupon code MEALPLAN at checkout. (Online orders only). In today's fast-paced world, providing delicious home cooked meals is not always easy. Now, your busy schedule doesn't have to compromise between time and quality when it comes to dinner. 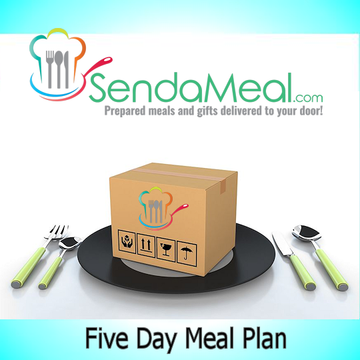 Send a Meal give you an easy and affordable way to have a weeks worth of delicious meals delivered right to your door. Perfect for the most hectic of nights. We give you the ability to have great meals that you select without having to go to the grocery store or prepare the meals. This is all possible at a fraction of your valuable time, burden and cost. Use the drop-down menus to select your five meals. All of your meals will arrive at the same time. Simply place them in your freezer and heat them when you're ready to eat! Our savory Pot Roast is slow-cooked in a seasoned au jus and served with a medley of tender carrots, green beans, pearl onions and mushrooms. Enjoy homemade flavor just like mom used to make, except you don't have to spend hours in the kitchen preparing it! Just heat and serve. Meal serves 4. Taste a bit of Italy in your home tonight! These boneless, skinless chicken breasts are marinated with Italian seasonings of Romano cheese, garlic, onion and parsley. To go along with your feast are our tempting Roasted Garlic Mashed Potatoes and Green Beans. Meal serves 4. Lean Top Sirloin Steaks are perfect for you! Each steak has a bold, beefy flavor and is naturally lean! Add Natural Seasoning and treat your family to a meal complete with Roasted Garlic Mashed Potatoes, and Green Beans. This complete meal serves 4. Treat the seafood lover in your house to a meal they won't soon forget! Hand rolled Sole Fillets, wrapped around a delicately seasoned blend of scallops and crabmeat, the perfect combination of seafood flavors! This complete meal serves 4. The taste of home cooking, without all the fuss! You'll love these boneless, center cut, juicy pork chops. Each pork chop is hand-trimmed to perfection. Add our special Natural Seasoning and you've got the perfect chop! This hearty meal is complete with Stuffed-Baked Potatoes and Roasted Vegetable Medley. Meal serves 4. Make tonight's dinner the perfect rendezvous! Tender, moist, fully cooked Roast Chicken Breasts make a tempting and convenient entrée. Served with a gourmet side of Broccoli and Cauliflower, splashed with Roasted Garlic Oil, and Roasted Garlic Mashed Potatoes, this dinner is both easy and delicious. Meal serves 4. Chicken Fettuccine Alfredo Savor 5-star Italian fare - in a flash! Order this scrumptious improvement on a classic: generous chunks of chicken breast and fettuccine in a creamy Alfredo sauce with zesty Romano and Parmesan cheeses. It's completely prepared for you, fully cooked, frozen and ready for your microwave or oven. So easy and truly delizioso! Shrimp Fettuccine Alfredo Crisp, succulent shrimp. Perfectly al dente fettuccine. Rich, creamy Alfredo sauce made with real grated Parmesan cheese. This Italian seafood classic is richer and easier than ever delivered to your door. - it arrives ready for the microwave or oven straight from your freezer. Ocean-fresh, boneless, skinless Atlantic salmon fillets are marinated in an exquisite mixture of olive oil, garlic, paprika, onion, pepper and natural smoke flavor. Surround your fillets with real Idaho Russet Roasted Garlic Mashed Potatoes and green beans. Meal serves 4. Send our traditional meat lasagna, hand layered with seasoned ground beef, pasta, Mozzarella, Ricotta, Monterey Jack, Parmesan and Romano cheeses. Add a side of Whole Green Beans and a delicious NY Cheesecakes and you've got the perfect meal. Meal serves 4. Sweet, tender chunks of whole Maine lobster meat are blended with cream and sauteed onions and wrapped in made-from-scratch egg pasta. The light broth sauce is made with white wine, basil and butter. Simply boil pasta, heat sauce and you've got a gourmet dinner for four.